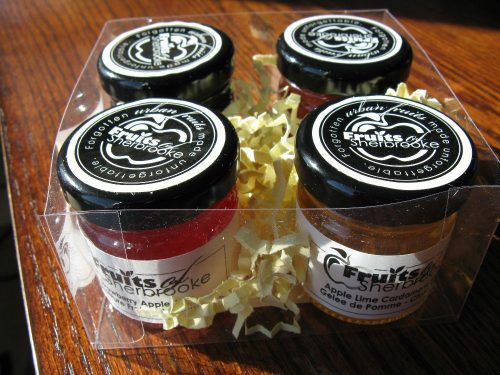 This is a gift box of 4 of the popular jams and jellies. There are 4 jars in the box and the flavours are: Blueberry Rhubarb Jam. Lime Cardamom Apple Jelly, Gingered Saskatoon and Apple Jam, Strawberry Apple Jam. Each jar is 40 ml and contains enough for 2 pieces of toast. This is a perfect Hostess gift, or for a grandparent or for you to try a out at home. The bonus is that the jars are small enough that you can carry them on the airplane in your carry-on luggage. We use our profits to make fruit snacks for food programs in the city that support those who are in need. Over the last 2 years with the manpower of wonderful volunteers we have made and donated about 27,000 individual snacks. These are apple chips, fruit leather, and apple sauce tubes. We also provide work experience and volunteer opportunities for those who want the opportunity to contribute to others. This is usually with the apple snack program. Some tasks are perfect for those who have a variety of limitations. When it comes to picking we will priorize those who are no longer able to care for their fruit trees. We use local fruit that grows in people's yards instead of letting it go to waste. We also work with other groups in the city who want local fruit for their charity or food programs. By speaking to homeowners we are able to educate them about the apple maggot infestation and proper disposal of their yard waste. By teaching preserving classes we help homeowners find ways of using their own fruits. We compost and recycle whenever possible. We are a small not for profit group that 'rescues' urban fruit that is excess to homeowners needs. We make jams, jellies and condiments that contain a minimum of 60% locally rescued fruit and many are 100% or close to that. It is an environmental mission to use what already grows here in our city while providing entry level jobs and work experience. This is the essence of living locally - to preserve what we already grow here, teach classes on preserving, and make great products to showcase our mission. Our products have no additives, artificial flavours or other chemicals. Our small profits go towards making fruit snacks such as apple chips, apple leather and apple sauce tubes that are donated to high needs food programs in our city. Over the past 2 years with the help of wonderful volunteers this has resulted in 27,000 individual snacks. The 4 jars are pre-selected and you cannot make your own choice of jams for the box. Each jar is 40 ml. There is another Singles Gift box - selection B (black) and it has the following selection: Ginger Pear Jelly, Raspberry Rhubarb Jam, Mango Apple Jam and Saskatoons in Summer Fruit Jam. each product has a minimum of 60% and up to 100% of locally rescued fruit. For exact details on each product please go to their individual listing. We sell at Farmer's markets. Summer: St Albert FM on Saturdays 10 am to 3 pm. 124 Street Grand Market on Thursdays from 4 pm to 8 pm. Callingwood FM on Sundays from 10 am to 3 pm. Studio Bloom at 10991 - 124 Street is open Tuesday to Saturday for business hours and carries our full line. See our website for other locations.